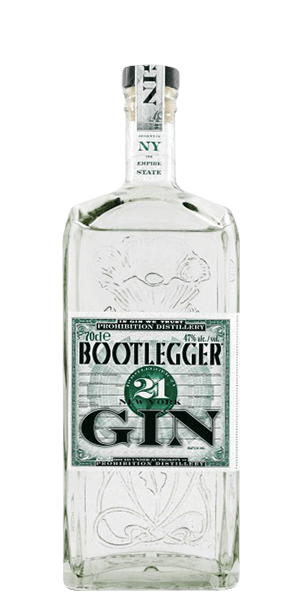 Bootlegger 21 New York Gin is adored for its lemon, botanicals, orange peel and coriander flavor notes. This Gin is carefully distilled at Prohibition distillery, United States. Based on 45 votes, the average rating for Bootlegger 21 New York Gin is 8.7/10. — Great gin at a price that can't be beat. — It’s my new favorite. My Cuban husband has put his favorite rum in semi-retirement to enjoy this gin on a daily basis. Great gin at a price that can't be beat. It’s my new favorite. My Cuban husband has put his favorite rum in semi-retirement to enjoy this gin on a daily basis. One of my favorite Gin, citrus flavor was well-defined. Has a smooth and clean finish. Probably the best gin I've had to date. Very clean juniper and citrus, which goes perfect with a lightly flavored tonic. The higher ABV is nearly unnoticeable in this finely crafted spirit.